While European countries struggle to manage the recent influx of refugees and migrants, a quieter trend has been occurring: large numbers of talented residents leaving. Deeply familiar to low- and middle-income countries, the phenomenon of "brain drain" -- the loss of precious human capital to opportunities elsewhere -- has recently become a concern in parts of Europe, including some high-income countries still trying to find their footing after the economic shocks of 2008 and the ensuing fiscal crisis. In the fallout from the global economic crisis, Greece, Italy, Portugal, and Spain have in some ways returned to their earlier roles as significant countries of emigration. MPI's Transatlantic Council on Migration convened its twelfth plenary meeting to discuss the implications of emigration for middle- and high-income countries. Participants examined the realities of today's complex emigration flows, which are younger and better-educated than in the past, and explored how sending and receiving governments can manage these flows and reap the potential benefits of emigration. Drawing on the conclusions of the meeting, this Council Statement by Council Convenor and MPI Europe President Demetrios G. Papademetriou outlines a series of guiding principles to help governments manage emigration effectively, which emphasize the importance of long-term structural reforms, diaspora engagement, and cooperation with destination countries on qualifications recognition. 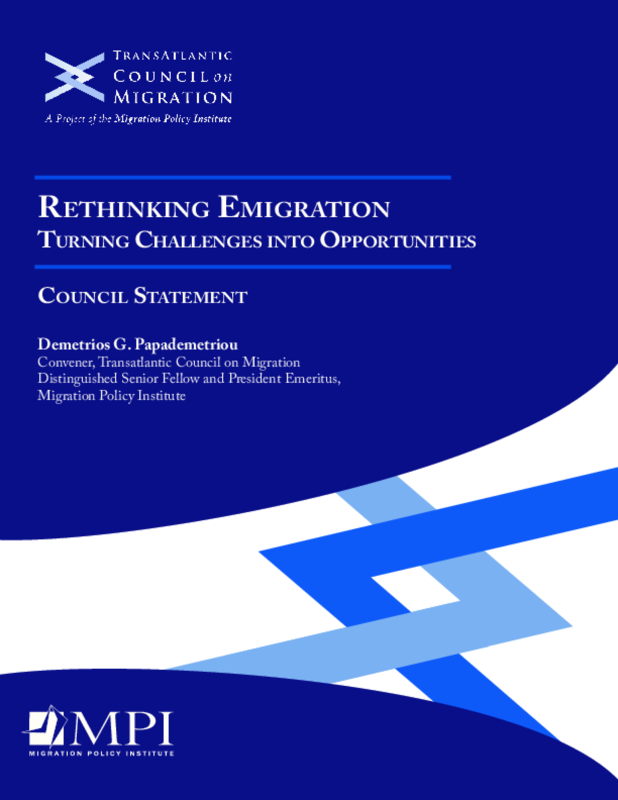 The Council statement also identifies two areas in particular where investment in proactive policies can make a substantial difference in drawing on the benefits of emigration while reducing its costs: engaging nationals abroad, and enticing them to come home by creating new opportunities for them to use their skills. Copyright 2015 Migration Policy Institute, Transatlantic Council on Migration.